An important partnership, designed to promote life jacket usage for lake visitors, will continue on in 2019. For several years, the Grand River Dam Authority and the Grand Lake Power Squadron (GLPS) have worked together to distribute free life jackets across the Grand Lake area. In fact, since 2016, GRDA has provided over $20,000 in funding to the GLPS to purchase life jackets. The funding and the partnership have helped to promote life jacket use and even supply life jackets to many of the visitors coming to Grand Lake’s waters each year. 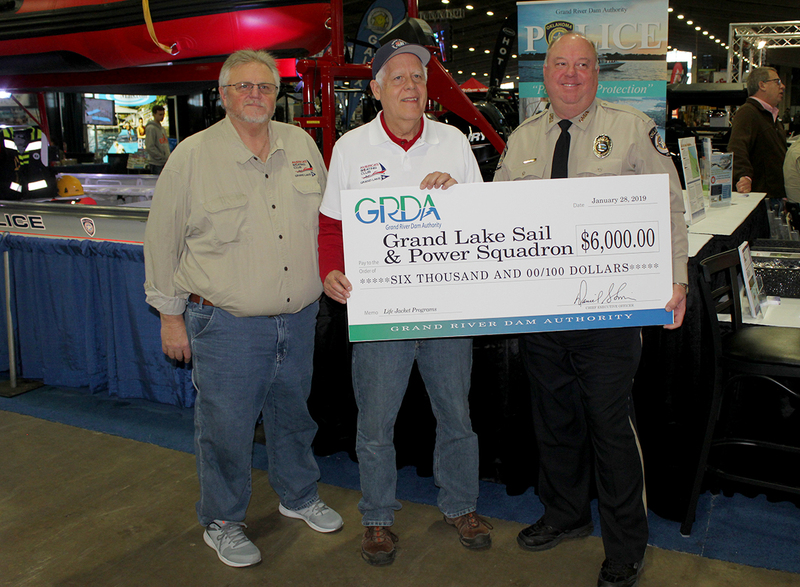 GRDA Community Relations Officer Ed Ferguson (right) presented a $6,000 check to Grand Lake Power Squadron Executive Officer Scott Graves (left) and Commander Kevin Kamrath at the Tulsa Boat Show on Friday, February 1. Funds will be used to support several life jacket distribution programs in the Grand Lake region. At the Tulsa Boat Sport &Travel Show on Friday, February 1, GRDA presented the GLPS with $6,000 to help fund the program for the coming year and advance its water safety mission. The GLPS will use the funds to purchase life jackets, which will be distributed to needy recipients at both the Grove Boat Show (March 7 – 10) and the Grand Lake Camp Bandage event scheduled (June 8, 2019). At both events, GLPS volunteers will also provide assistance on proper life jacket sizing. Additional life jackets will also be purchased to stock free loaner stations located around the shores of Grand Lake. Stocked with United States Coast Guard (USCG) approved jackets in a variety of sizes, these stations can be a resource for lake visitors who do not arrive with a properly-fitted jacket. The GLPS maintains five loaner stations throughout the lake season at public boat ramps located at Bernice State Park, Wolf Creek Park, Honey Creek State Park, Elk River Landing and Twin Bridges State Park. The GLPS welcomes the donation of funds or life jackets that can be used in these programs. New or gently used USCG approved life jackets can be dropped by the Grand Lake Visitor Center (9630 US Highway 59, Grove, Oklahoma) to be added to the distribution programs. GLPS is a non-profit boating organization located in Grove, on the shores of Grand Lake. The GLPS is a member of District 30 of the United States Power Squadron. Headquartered in Vinita, GRDA is Oklahoma’s state-owned electric utility; fully funded by revenues from electric and water sales instead of taxes. GRDA also manages 70,000 surface acres of lake waters in Oklahoma, including Grand Lake, Lake Hudson and the W.R. Holway Reservoir. Each day, GRDA strives to be an “Oklahoma agency of excellence” by focusing on the 5 E’s: electricity, economic development, environmental stewardship, employees and efficiency.